Residence "this property", built in 1993. In the district of Rothéneuf - La Varde, in a quiet position, 150 m from the sea, 250 m from the beach. For shared use: garden with lawn, swimming pool fenced (18 x 8 m, 15.06.-15.09. pool opening hours: 09:00-20:00). Outdoor shower, tennis, table tennis. In the complex: washing machine (extra), tumble dryer (extra). 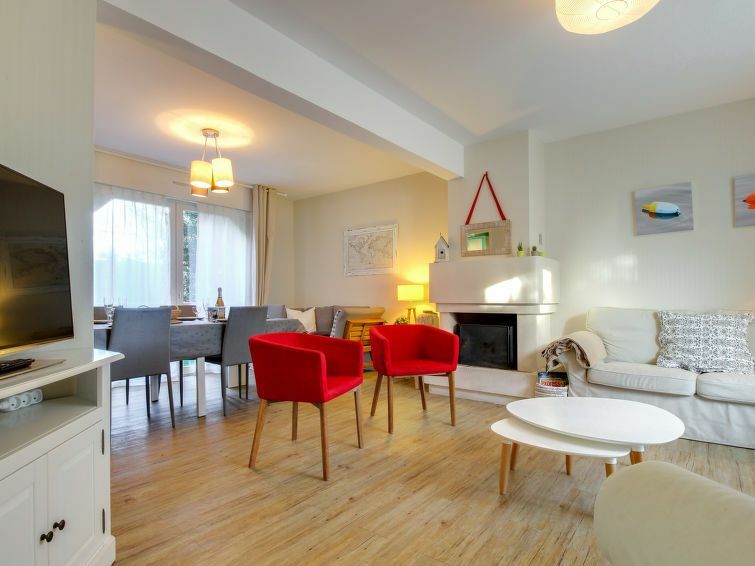 Shop, grocery, restaurant 900 m, sandy beach "Plage du Pont" 250 m, diving center 6.5 km, outdoor swimming pool 6.5 km, thermal baths "Les Thermes Marins de Saint Malo" 3.5 km, swimming bay 150 m. Sports harbour 6 km, marina 6 km, golf course 15.6 km, surf school 3.5 km, tennis 50 m, riding stable 10 km. Nearby attractions: Les Rochers Sculptés 1.4 km, Musée Jacques Cartier 2.1 km, Le Grand Aquarium 7.8 km, Cancale 12.4 km, Dinard 15.6 km, Mont Saint Michel 58.7 km. "maison des Corsaires", 5-room house 100 m2 on 2 levels. Object suitable for 6 adults + 2 children. Spacious and bright, comfortable and tasteful furnishings: large living/dining room with open-hearth fireplace and TV (flat screen). Exit to the garden. Large kitchen (dishwasher, 4 ceramic glass hob hotplates, microwave, freezer, electric coffee machine). Exit to the garden. Sep. WC. Electric heating. Upper floor: 1 room with 2 beds (90 cm, length 190 cm). 1 room with 1 french bed (1 x 160 cm, length 190 cm). 1 room with 1 french bed (1 x 160 cm, length 190 cm). 1 room with 1 french bed (1 x 140 cm, length 190 cm). Bathroom, sep. WC. Parquet floors. Facilities: washing machine, dryer, iron, hair dryer. Internet (WiFi, extra). Reserved parking (2 cars). Please note: suitable for families. Non-smoking house. Smoke alarm.